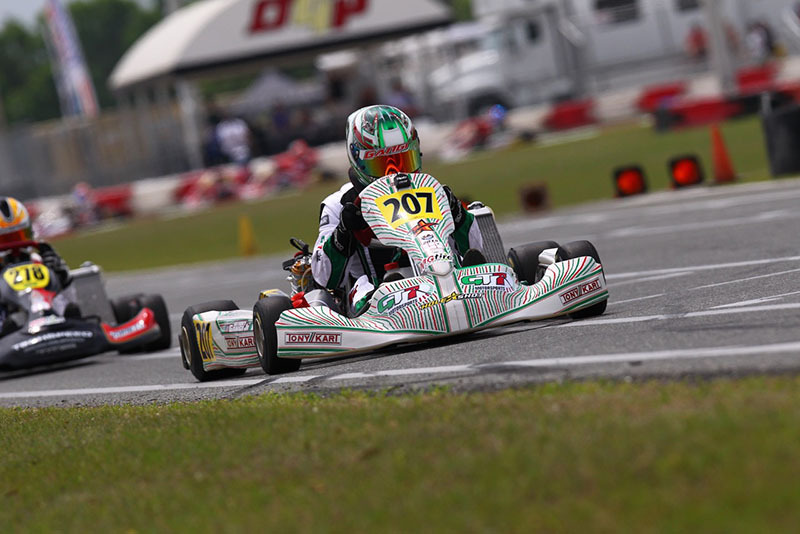 As the 2015 Cold Stone Florida Winter Tour came to a close for the ROK Cup USA competitors this past weekend, Anthony Gangi Jr. was in the thick of it for the Vortex ROK Junior victory. Always a threat, the GT7 Motorsports pilot attacked the finale weekend looking to secure as many points as possible towards the championship chase. With the event taking place at the Ocala Gran Prix facility in Ocala, Florida, hot temperatures and changing track conditions challenged the best teams and drivers from around the world. Showing speed in unofficial practice leading up to Saturday morning’s qualifying efforts, Gangi Jr. would claim the sixth quickest lap of the timed session. Lining up for his first of three progressive heat races on the outside of row three, the Tony Kart driver quickly worked his way forward to score a solid second place result. Starting the next heat where he has finished the first one, Gangi Jr. would fall back to the fifth position before posting another second place result in the third and final heat of the day. With the heat race points tabulated, the New York resident would secure an outside front row starting position for championship Sunday’s prefinal race. With a talented group of ROK Junior drivers, Gangi Jr. would battle hard at the front of the field. Falling victim to an outside row starting position, the impressive junior competitor would endure a hard fought battle to cross the line in the fourth position. Sunday’s main event would see Gangi Jr. put his talent to work. Again falling back due to a poor outside row starting position, the multi-time champion would drive forward to the third and final step on the podium. With the main event finish and his bonus points from the previous day’s heat races, Gangi Jr. vaulted his way to a fifth place finish in the overall series point standings. Taking only a day or two away from the track, Gangi Jr. will trade his Vortex ROK Junior package in for his Rotax Junior machine. With one victory already secured in the young 2015 season, the Tony Kart driver currently sits sixth in the class championship standings before the mandatory one race drop. With bonus points available and a Rotax MAX Challenge Grand Finals ticket to join Team USA on the line, Gangi Jr. will look to add to his resume and win total as fights to ensure he claims the checkers in the final round of the 2015 Cold Stone Florida Winter Tour. Anthony Gangi Jr. would like to thank tuner/driving coach Mike Doty of Mike Doty Racing, Brian Krummel for the tuning assistance, Chad Brackens of Race Data Dynamics for all the data support, Daniel and Gary Woltjer of Woltjer Engines, as well as sponsors GT7 Motorsports, Millwork Solutions, Hole Shot Drive Systems, PKT, and Hot Head Engine Preheaters.